If you’re interested in becoming an exhibit sponsor, contact Jessica Summers, Director of Development, at jsummers@beardsleyzoo.org or 203-394-6573. Creative marketing opportunity at one of many exhibits that make the Zoo great! Place your logo or company information on a graphic at exhibit, and advertise in front of 280,000+ visitors a year. The Zoo is always looking for new and fun ways to have our guests interact with and learn about animals. 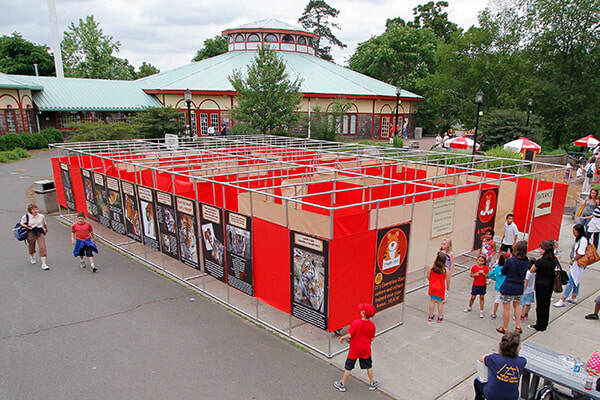 The Zoo has the opportunity to host a Maze or Traveling Exhibits in many different areas of the Zoo. Please call the Zoo’s Development Department at 203-394-6573 for more information on this very unique marketing opportunity.